Concertina wire was installed at the Hidalgo-Reynosa International Bridge Friday afternoon, Nov. 2. McALLEN — U.S. Customs and Border Protection and the U.S. Army Corps of Engineers announced they have awarded a $145 million contract for border wall construction to begin in February, according to an agency news release. 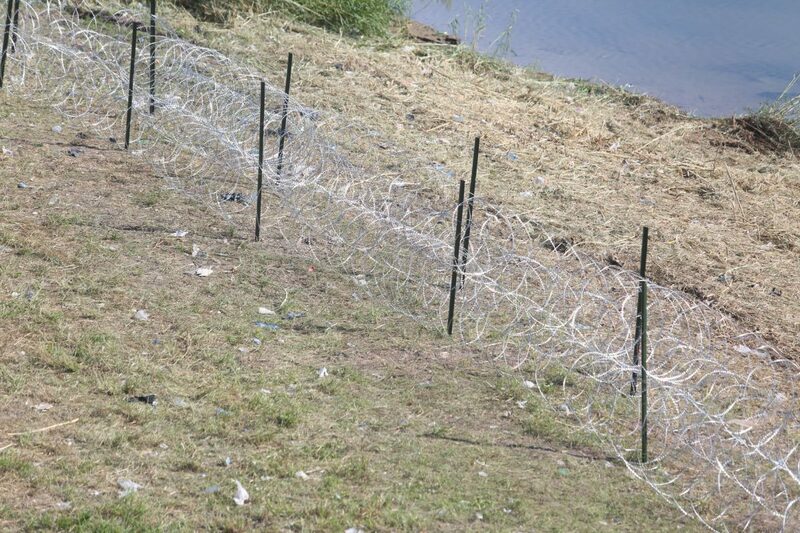 On the same day, National Guardsmen installed concertina wire at the Hidalgo-Reynosa International Bridge. Also seen under the bridge were troops wearing a patch associated with the U.S. Army’s 555th Engineer Brigade. This comes as the Trump administration continues its efforts to “harden the southern border” with thousands of active-military troops, and amid reports of a caravan of Central American immigrants seeking asylum en route to the U.S.-Mexico border. The contract, awarded Wednesday, went to Galveston-based SLSCO Ltd., and was funded through CBP’s 2018 fiscal year appropriation, the release states. 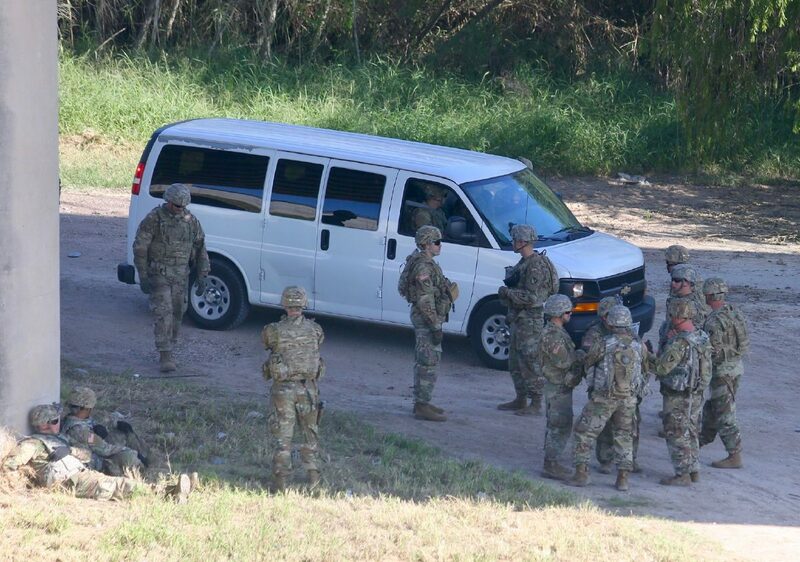 Uniformed troops are seen under the Hidalgo-Reynosa International Bridge Friday afternoon. Such infrastructure, according to the release, includes a “reinforced concrete levee wall to the height of the existing levee, 18 feet tall steel bollards installed on top of the concrete wall, and vegetation removal along a 150 foot enforcement zone throughout the approximately 6 miles of levee wall system. “ The enforcement zone will also include detection technology, lighting, video surveillance, and an all-weather patrol road parallel to the levee wall,” the release reads. The announcement comes on the heels of a public webinar Q&A held by U.S. Border Patrol and CBP officials, in which the public could ask officials about concerns related to the construction of levee wall fencing throughout Hidalgo and Starr counties. During that webinar, officials told those attending the session that they would not hold anymore in-person forums for those seeking to convey such concerns. Conservation groups filed a lawsuit in mid-October in response to waivers issued by the U.S. Department of Homeland Security to expedite the construction of walls in the Rio Grande Valley. In its filing, representatives from multiple conservation groups, including the Center for Biological Diversity, Defenders of Wildlife and the Animal Legal Defense Fund, challenge Homeland Security Secretary Kirstjen Nielsen’s issuance of the waivers filed last week. They argue in part that when Nielsen invoked the authority to set aside such waivers using “Section 102 of the Illegal Immigration Reform and Immigration Responsibility Act of 1996,” she exceeded the limited grant of authority for environmental waivers. That lawsuit is pending in federal court. The waivers Nielsen issued would effectively “speed up” construction of 18 miles of 30-foot high, levee-style border walls in Hidalgo County, as well as gates and other border wall infrastructure in Cameron County. Since last summer, CBP officials have met with local stakeholders about tentative plans and locations for the already funded 33 miles of projects slated for Hidalgo and Starr counties — 25 miles in Hidalgo and 8 miles in Starr. Local residents remain concerned about potential damage to places impacted by border wall construction, such as La Lomita Chapel, the National Butterfly Center and Bentsen-Rio Grande Valley State Park — all in Mission.